Chilean wines stood out in the blind tasting of China’s most popular wines sold online. It is clearly a country that offers amazing consistenty, quality and value. We are giving Wines of Chile the Diamond Country Award this year for submitting some of the most outstanding wines at excellent values. 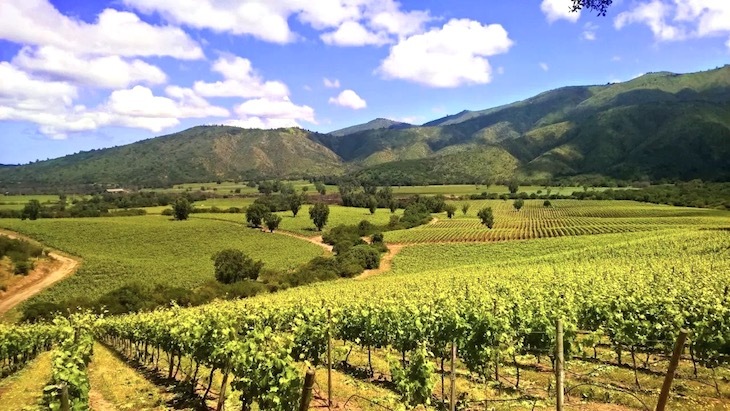 Congratulations to the Wines of Chile! Lovely Carmenere with ripe tannins and savory, herbal flavors. This is a fantastic example of the high quality Carmenere that Chile has been producing for the past 5 years. No longer are the Carmeneres tannic and green, the modern renditions are voluptuous, savory, herbal and sweet. This wine has ripe, sweet tannins and a fairly long finish. A wonderful Syrah that blends minerality and savory characters with sweet, dark berry fruit and dark spices evocative of cool climate Syrah. A beautifully crafted Syrah that offers the best of Chile’s sunshine with the earthy, spiciness of northern Rhone. A delicious Pinot Noir that delivers wonderful balance: filled with ripe, dark cherries, sweet spices and herbs, this is no ordinary, simple Pinot. There is depth, balance, grippy ripe tannins and a minerality that comes through in the finish. Given its modest price level, I would recommend this wine to anyone who enjoys Pinot Noir. A delicious Cabernet blend that is Bordeaux-like on the nose but offers the sweetness and generosity of a warmer climate generous red wine. Perfect to enjoy now, this wine is balanced, layered and quite intense with a persistent finish. A full-bodied, great value red wine from Chile. A delicious Syrah that has balance, spicy complex fruit without any heaviness. A medium bodied Syrah with subtle flavors that is ready to enjoy now. This is not a complex, powerful wine but it is filled with delicious flavors that are attractive and expressive right now. A delicious Cabernet Sauvignon that is balanced, subtle and filled with dark berry and plum fruit. There is wonderful harmony in its components with no jammy flavors or forward character; a wine that is confident and balanced. A subtle, layered Cabernet Sauvignon that has a generous body, smoky, meaty flavors with a plummy finish. This wine was tasted blind and it is clearly a warm climate Cabernet blend given its ripeness, but the flavors are not jammy nor flabby – the structure is quite firm and the flavors carry through to the finish. A very good value wine. This is a subtle, layered Pinot Noir that is more Burgundian in style than most Pinots from Chile. The fruit is restrained, minerally, savory and herbal with just hints of cherry and blackberry fruit. A wine that should keep well and offers great value.